Donald Trump walked out of an executive order signing ceremony at the White House without signing the document, CNN reports. Trump ignored a question from one of the reporters regarding his former national security adviser Michael Flynn. Flynn had reportedly offered to testify on Russian involvement in the US election in return for immunity from prosecution. However, when the question was asked, the President ignored the questions and moved to another room, only to be followed by Vice President Mike Pence, who picked up the folders containing the two executive orders. The orders aimed at identifying and targeting foreign trade abuses, according to the White House. A document the president later signed. One order commissions a 90-day study of US trade deficits with some of its largest trading partners to identify potential trade abuses and cheating. The second directive orders stricter and more effective enforcement of US anti-dumping laws to prevent foreign manufacturers from undercutting US companies by selling goods at an unfair price. 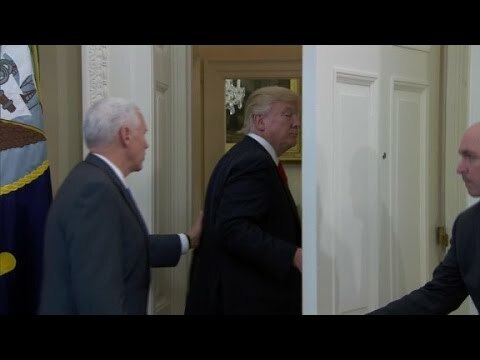 0 Response to "President Trump Walks out of Executive Order Signing Ceremony | WATCH"